A Question for Quilters » Embroidery Talk Has Moved! 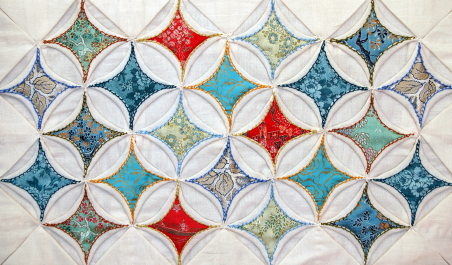 I’ll admit, I’m a devoted admirer of quilting, but don’t have a lot of practical knowledge. Mine is the sincere admiration of a person who wants to take beautiful quilts home and hang them on the wall as art, but who has no real practical knowledge, beyond the extremely basic, of how quilts are made. I am however, as many of you know, all about education, although in this case I’m hoping it will be you sharing some knowledge with me (not that you don’t always do that) instead of the other way around. My specific interest is in the types of backing or stabilizer that quilters use when they create, if I even have the terms right. I guess the first question I have would be about the terminology. I see the word backing used to refer to the material that comprises the underside of the quilt, the side that would lie on the bed. Then there is the term batting. From what I’ve read, batting goes inside the quilt and helps determine its weight and warmth, and then is covered by the backing. What I would call backing or embroidery stabilizer doesn’t even come into the equation, as far as I can tell, unless you plan to embroider squares or designs for your quilt. Am I correct about that? Finally, from what I understand, there are two basic types of quilting, hand quilting and machine quilting. Hand quilting is sewing the area to be quilted by hand. Machine quilting, which would be, I would think, where the stabilizer would come in, involves using a sewing machine or long arm quilting machine to create your quilt. I’m not sure, however, if you can embroider a quilt top all in one piece, or if you embroider portions or squares first and then piece them together or if it can be done either way. If you’re wondering why I’m asking all these questions, it’s really some exploratory research to see if EnMart should or could start offering supplies for quilters. We know that quilters already use Iris thread, so it seemed a natural fit to start adding some other supplies. I’m just trying to gather some information as to what we might want to offer and if offering quilting supplies would be a good fit. If you quilt and you have any opinions to offer, I’d love to hear them. This entry was posted on Tuesday, April 10th, 2012 at 4:38 pm and is filed under Backing/Stabilizers. You can follow any responses to this entry through the RSS 2.0 feed. Both comments and pings are currently closed. Backing on a quilt is exactly what it says, it is the back of the quilt. Hand quilting is sewing(quilting) with quilt thread and hand needles called betweens and machine is done on the machine. I prefer to hand piece and quilt I find it relaxing . Your answer was very helpful Bonnie and I appreciate it. Thanks for taking the time to comment. Thanks for taking the time to comment Sharon. We appreciate it. Hey Kristine! I wanted to throw my 2cents worth in here. I use fusible stabilizer when I make tshirt quilts or any other quilts using clothing of any kind that has a stretch. I also want to throw something out there about you possibly carrying quilt stuff. You know I love you guys and your products but I would encourage you to think twice about selling products just because you might have someone who would buy it. While I try to purchase from vendors that carry the most amount of stuff in order to save on shipping, there is also something to be said about selling what you know. I depend on my vendors to be able to instruct me sometimes on which products are best for my needs. If you choose to go that route, I would strongly think about hiring a quilt expert to advise you on what to carry as well as be able to advise your customers on their needs. I just know from personal experience that it is not always best to just carry stuff for the sake of being able to sell it. I got to the point where I felt that I was doing my customers a disservice because I knew other businesses could service them better.So I went back to what I know and that is just the embroidery and some limited quilting such as the tshirt quilts. Just my two cents worth and hopefully I did not offend you in any way because that not my intention. Just throwing out my opinion. You make a very good point and we always try to be aware of that very thing when we look at what we might want to sell and why. The conversation started because we already sell backing and we were looking to see if we could reach out to quilters that way. We’ve also done some talking about the possibilities of sublimation and quilting. We don’t want to be the company that sells everything and knows nothing about the things we sell. That’s why we do research and ask questions and evaluate whether or not what we’re looking at is right for us. I’m with you in that I’d rather have us be good at selling a few things than do a disservice to our customers by selling a lot of things that we don’t understand. Thanks for your input. It’s great to know we have customers who care about the direction in which the company is going.